These just happen to be two of my favorite pasttimes.. It was just by pure luck that this image got framed this way. And if you look at the edge of the poster and one of the pegs on the guitar head, you'll see the illusiion I'm referring to. 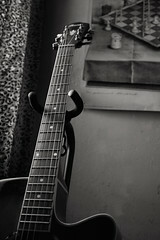 The indentation on the edge of the poster is actually part of the poster image.. it just so happened that the guitar was framed almost perfect to make it look like it was making the indentation on the poster. I'm telling you, I didn't even see that till the end of the day after I downloaded the images. I remember being more busy with how much of the guitar I could fit in frame, AND keep the poster of the chess board in frame as well.